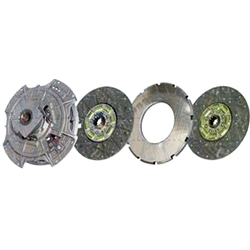 This is a new Spicer Style 14" x 10T x 1-3/4" Pull Type Angle Spring Organic Clutch Set. It is used in a Pot flywheel having a depth of 2.937". This clutch is made completely in the USA. 14" x 10T x 1-3/4"
Engine Torque = 1150 lb-ft.
For Service Manual, see here. For Installation Guide. see here.